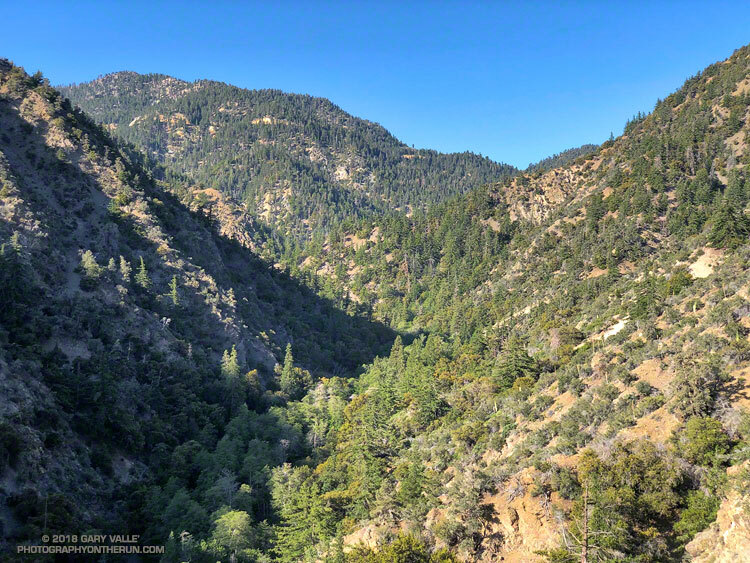 Looking back up the South Fork canyon from the South Fork Trail. Highway 2 and Mt. Islip can be seen at the head of the canyon. Mountain mahogany (Cercocarpus betuloides) along the South Fork Trail. 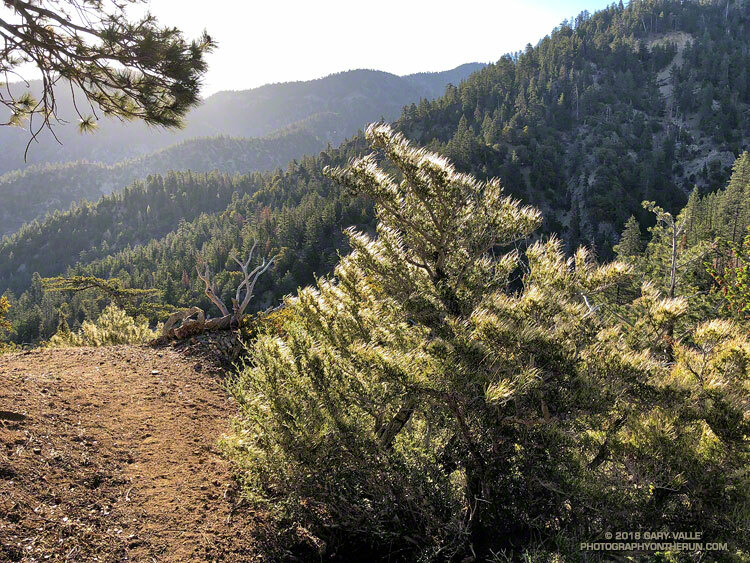 Runners on the South Fork Trail. 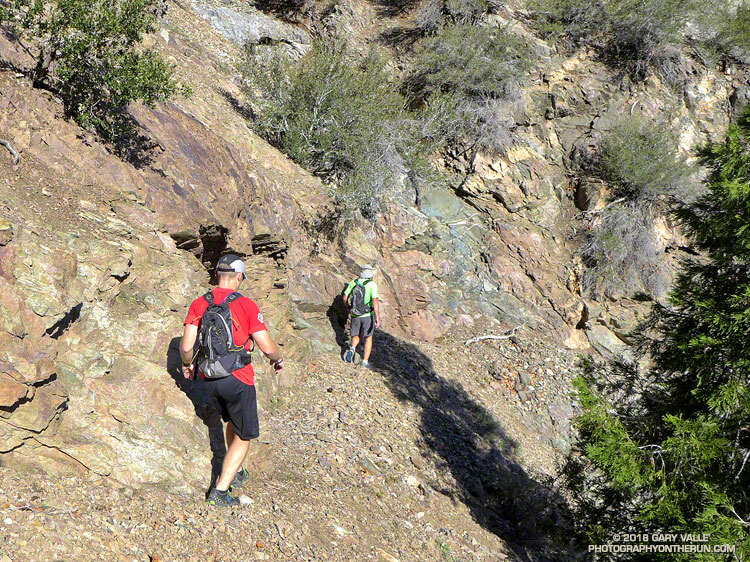 There are many (usually) small scree and rock slides on the trail. From a run in May 2013. South Fork Campground from near the bottom of the Manzanita Trail. 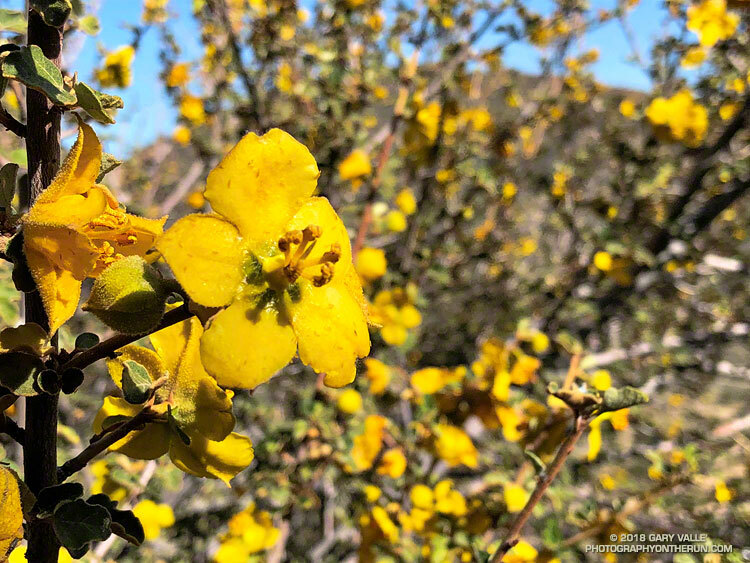 Flannel bush (Fremontodendron californicum) along the Manzanita Trail near South Fork Campground. June 2, 2018. 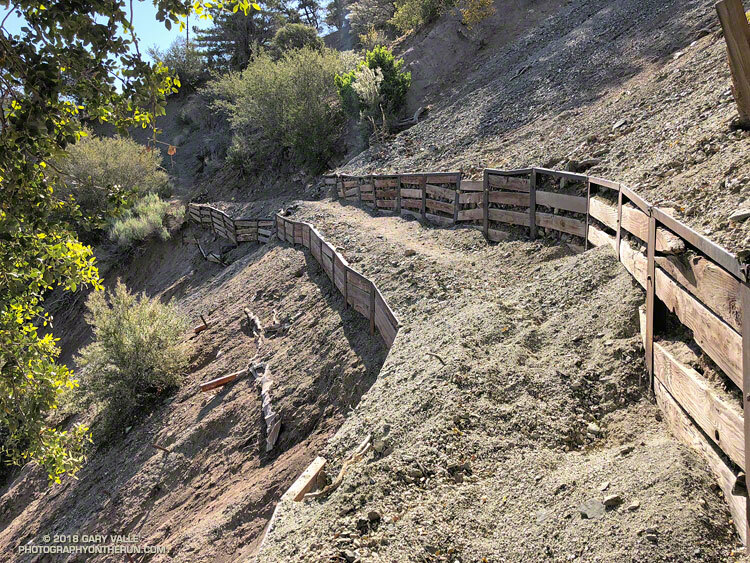 Stabilized section of the Manzanita Trail. 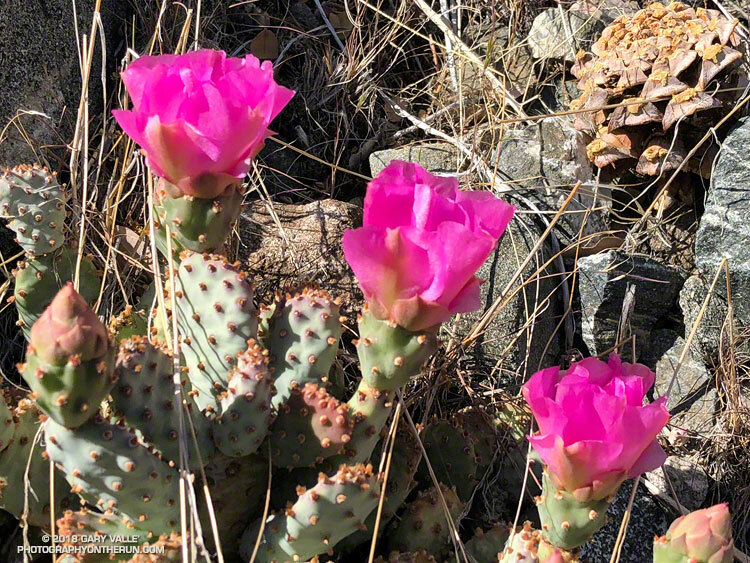 Beavertail cactus (Opuntia basilaris) along the Manzanita Trail. June 2, 2018. 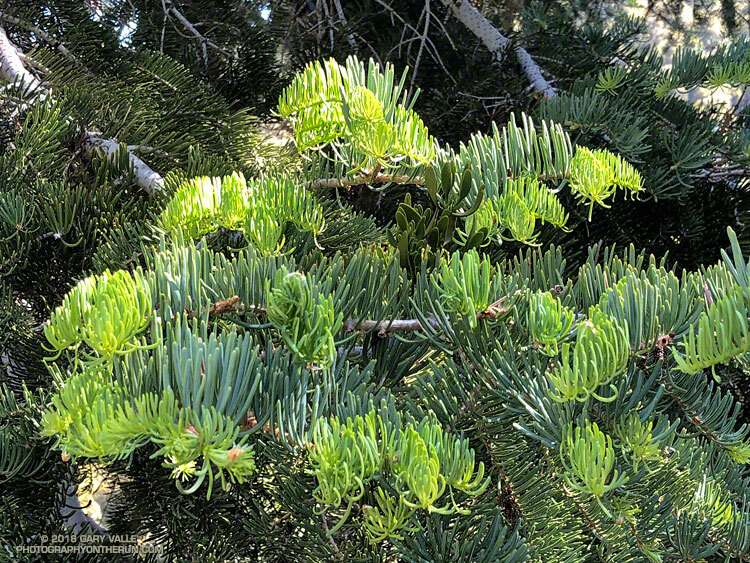 New growth on a white fir along the Manzanita Trail. June 2, 2018. 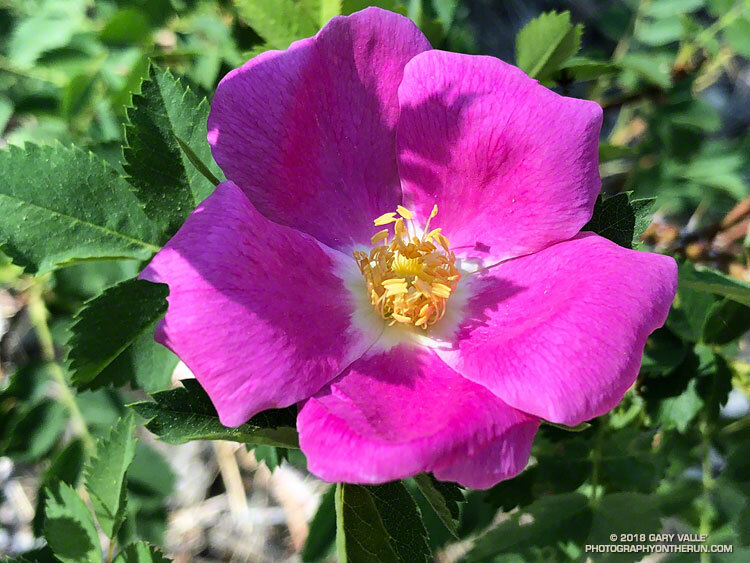 Wood rose (Rosa gymnocarpa) along the Manzanita Trail. June 2, 2018. 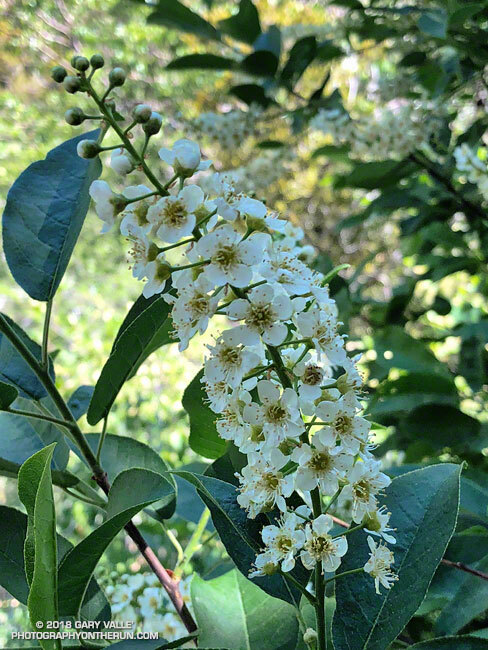 Western chokecherry (Prunus virginiana var. demissa) along the Manzanita Trail. June 2, 2018. 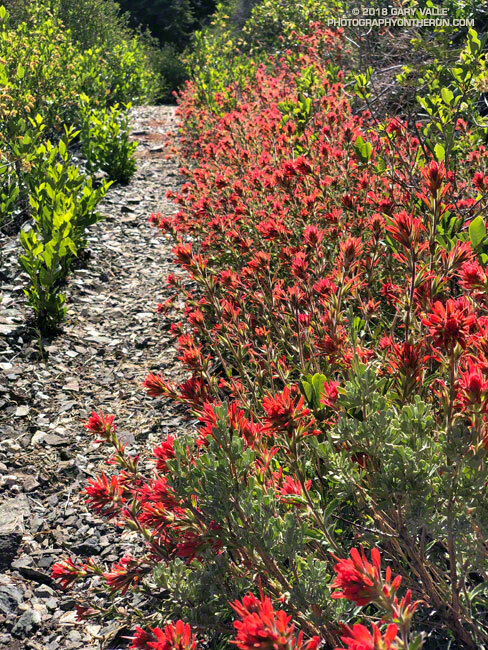 Paintbrush along the Manzanita Trail near Vincent Gap. June 2, 2018. Devil's Punchbowl and the South Fork from the PCT, high on Mt. Baden Powell. 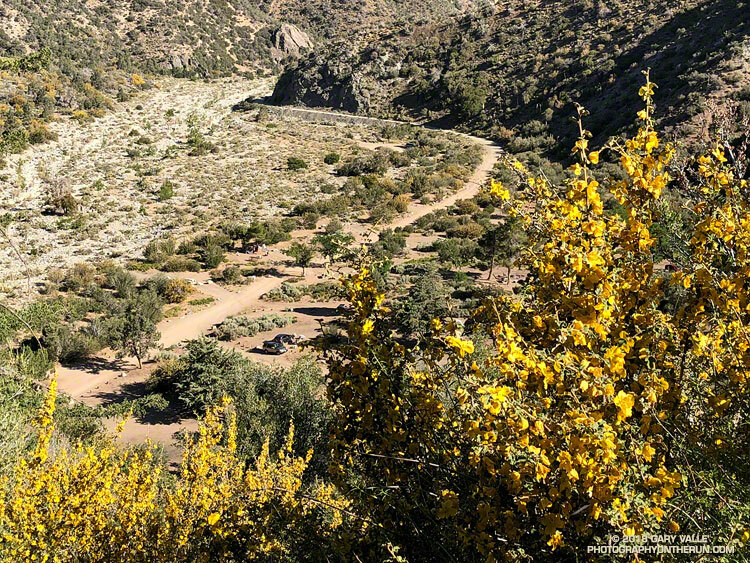 The wash in the center of the photo is where South Fork Campground is located and the Manzanita Trail begins. Nearing the summit of Mt. Baden Powell (9399'). 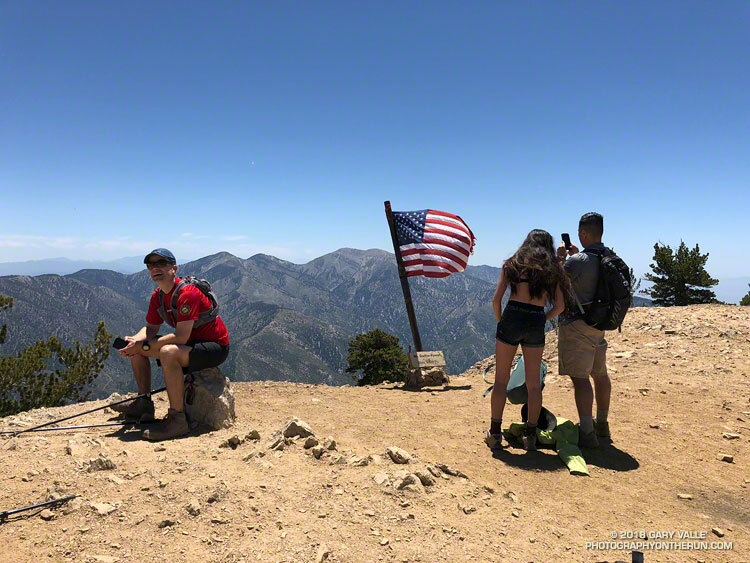 The PCT reaches its highest point in Southern California at its junction with the Mt. 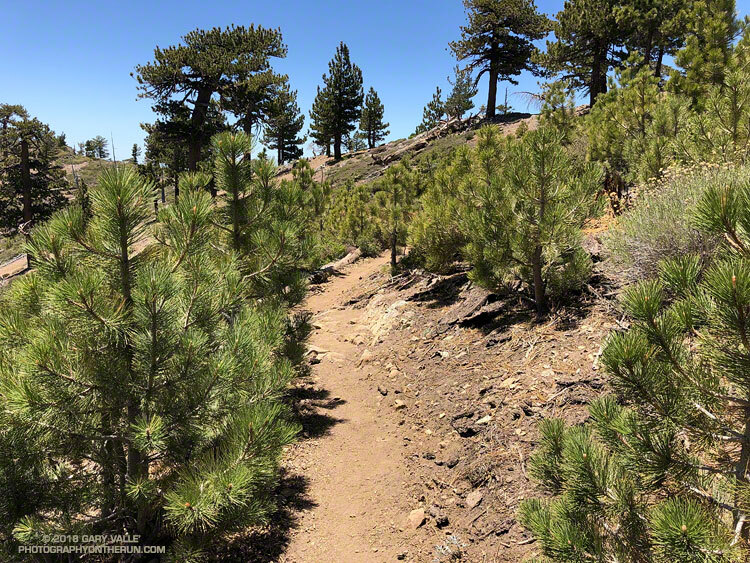 Baden-Powell summit trail, near the Wally Waldron Limber Pine. The elevation of the junction -- which is just ahead -- is about 9230'. 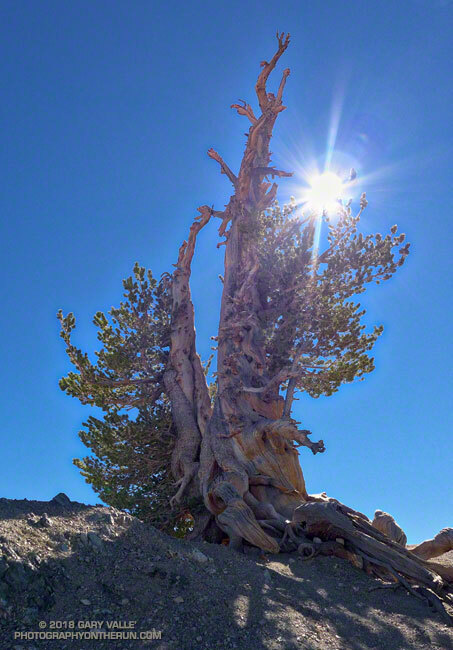 The Wally Waldron Limber Pine. The tree is estimated to be about 1500 years old. It's just below the summit of Mt. Baden-Powell. From a run in October 2012. 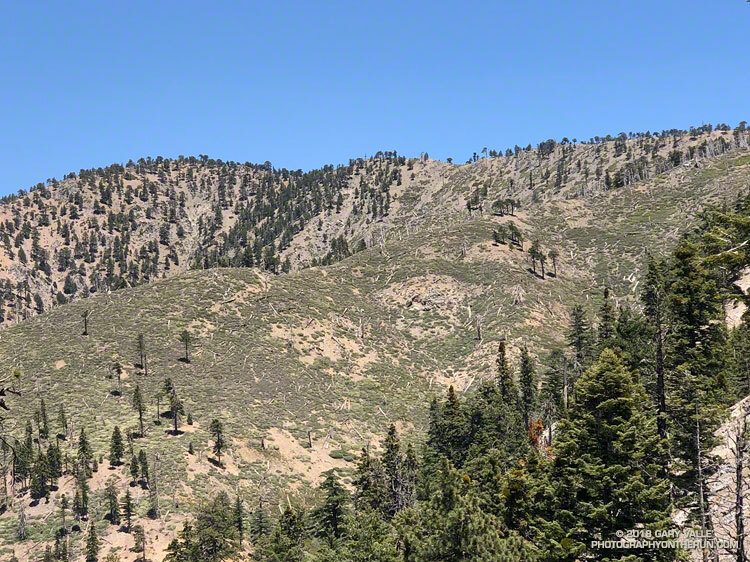 The white arrow indicates the location of the Wally Waldron Limber Pine on Mt. Baden-Powell. The summit of Mt. Baden-Powell (9399'). 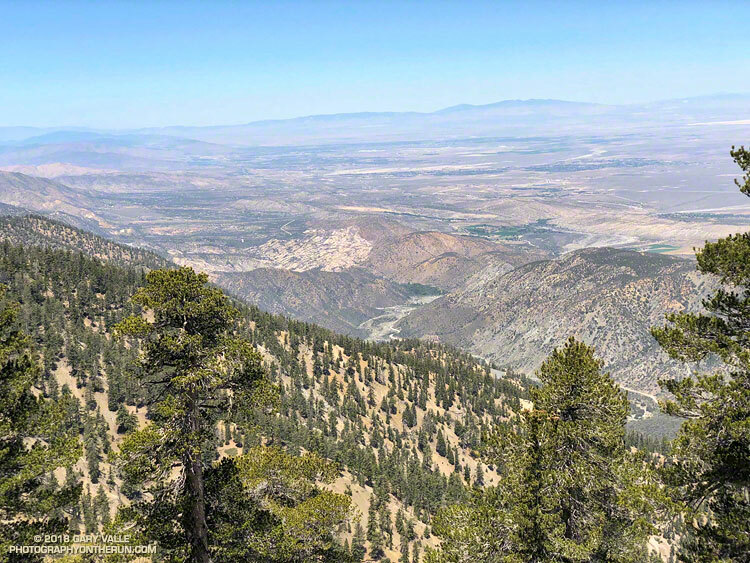 Pine Mountain, Dawson Peak and Mt. Baldy are in the distance. 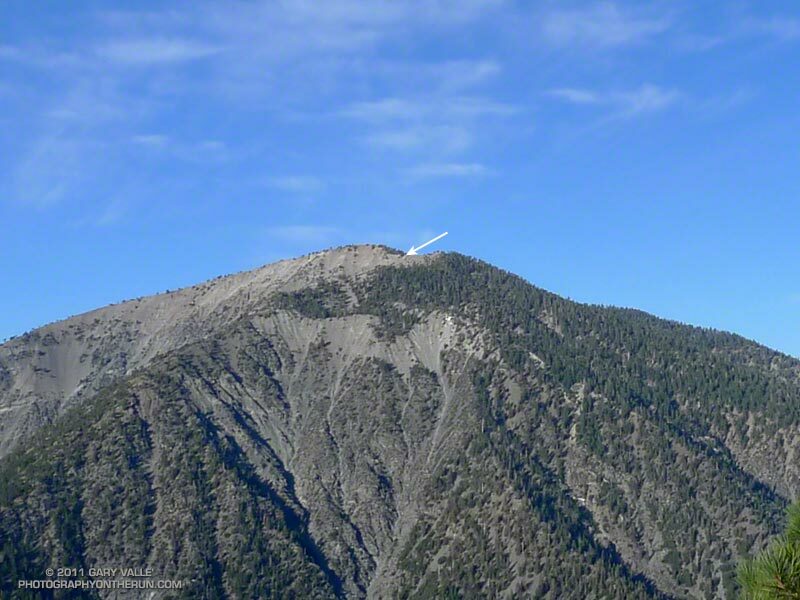 When there is less haze, San Jacinto Peak can be seen in the gap between Dawson Peak and Mt. Baldy. 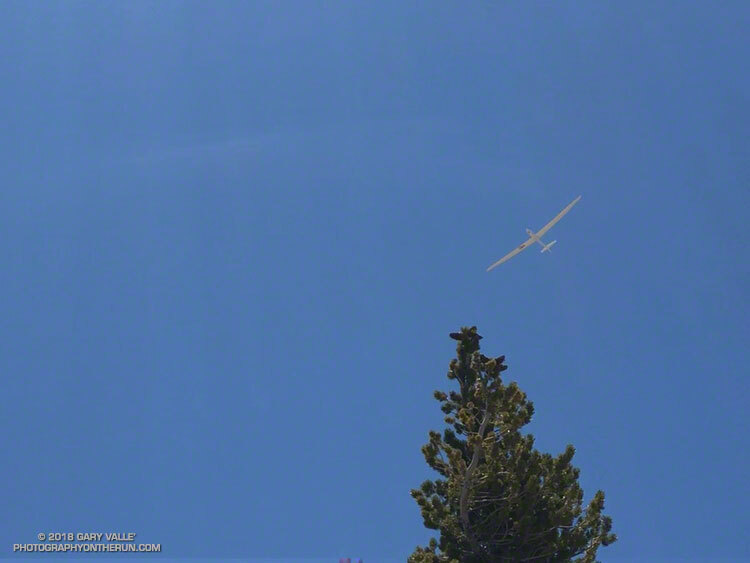 A sailplane thermaling above Mt. Baden-Powell. Trees killed in the 2002 Curve Fire on the ridge northwest of Mt. Hawkins. Teenage trees of the 2002 Curve Fire near Throop Peak. 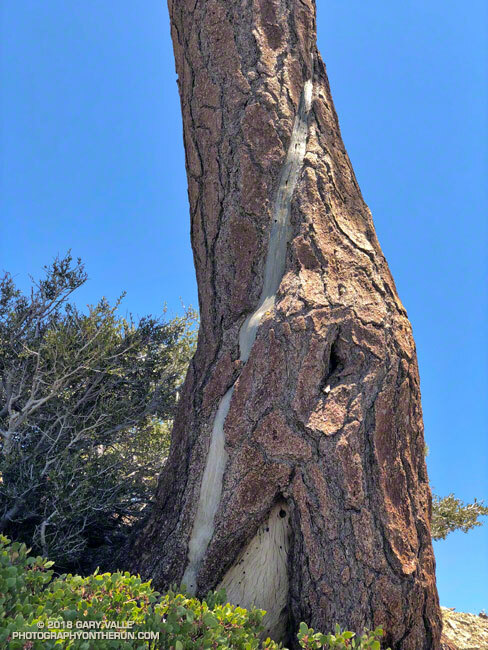 Spiral scar from a lightning strike on a Jeffrey pine near Mt. Hawkins. 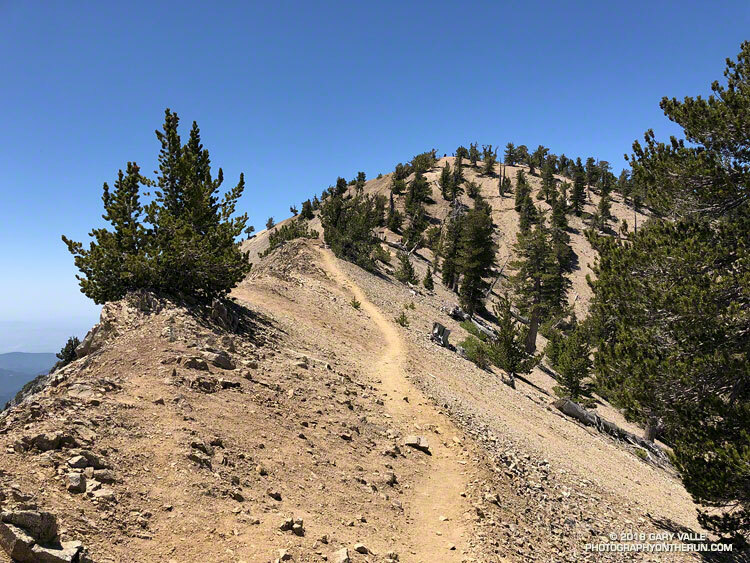 Google Earth overview of the Islip Saddle - South Fork - Mt. 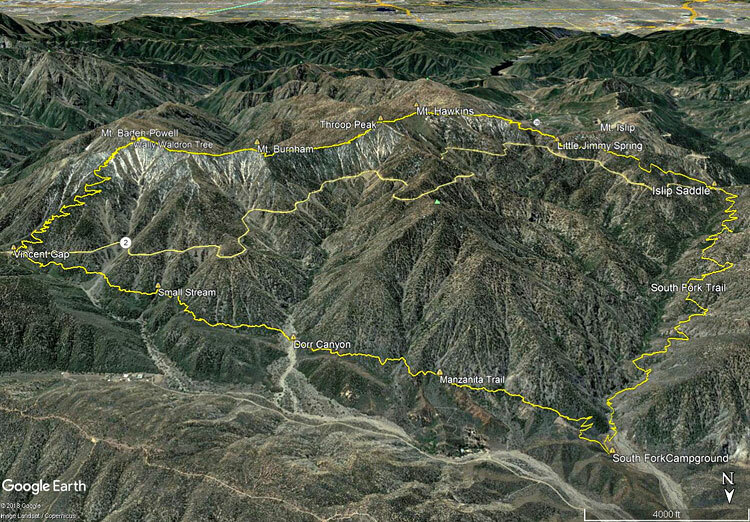 Baden-Powell loop.